For the town in Japan, see Iwade, Wakayama. 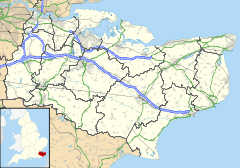 Iwade /ˈaɪˌweɪd/ is a village and civil parish 2 miles (3.2 km) north of the town of Sittingbourne in the English county of Kent. It lies on the old route of the A249 road to the Isle of Sheppey but was bypassed when the road was upgraded to a dual carriageway in 2006. Iwade is the nearest settlement to Swale railway station. According to Edward Hasted, in 1798, the manor of Warde, was within the hundred of Teynham. It had sixteen houses, and about 60 or 70 inhabitants. Although small, Iwade has a primary school, nursery, health centre, village hall, public house (The Woolpack) and post office and village shop. The village church is dedicated to All Saints and is a Grade I listed building It is within the diocese of Canterbury, and deanery of Sittingbourne. The village also features the Sittingbourne Speedway track, which offers speedway training facilities for riders all over the country. It was the base of the speedway team Sittingbourne Crusaders who raced in the Conference League sporadically from 1995 until 2008. In 2014, during the development of new homes, a henge was discovered. In February 2016 the village council erected its flag pole on the mound, as you enter the village. ^ "Civil Parish population 2011". Neighbourhood Statistics. Office for National Statistics. Retrieved 21 September 2016. ^ a b Hasted, Edward (1799). "Parishes". The History and Topographical Survey of the County of Kent. Institute of Historical Research. 6: 203–206. Retrieved 27 February 2014. ^ "Church of All Saints, Iwade". www.britishlistedbuildings.co.uk. Retrieved 27 February 2014. Wikimedia Commons has media related to Iwade. This Kent location article is a stub. You can help Wikipedia by expanding it. This page was last edited on 6 March 2019, at 01:28 (UTC).